Capt. 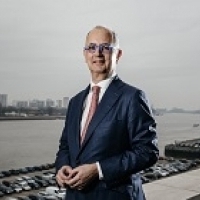 Marc Nuytemans is the Managing Director of Exmar Shipmanagement N.V since 2009. He is a member of the executive committee of Exmar N.V., a Belgian maritime company quoted on the Belgian Stock Market (BRU:EXM). He lectures at the University of Antwerp and is a member of the Royal Commission for the revision of the Belgian Maritime Law. After an extensive career at sea he became fleet personnel manager at CMB nv in 1997. In 2000 he took up the position of Managing Director of the Royal Belgian Shipowners’ Association leading the revival of the Belgian register. Caritas International, an ngo active in more than 200 countries/regions helping victims of war, natural disasters, migration and poverty. Capt. Marc Nuytemans isa Fellow of the Nautical Institute and a member of the executive board.